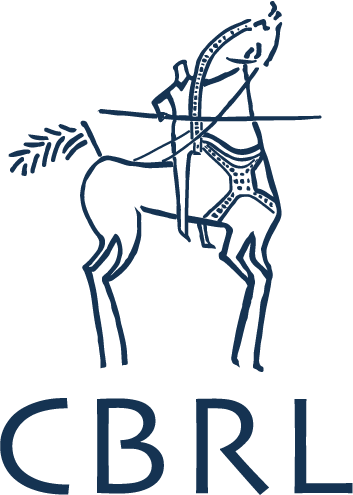 This blog was originally posted as part of the 'Day of Archaeology' 2014 (11 July 2014). You can find all posts, and information, on their website: http://www.dayofarchaeology.com. The well defined walls of kites on the Jordanian harra - Safawi Kites 99 & 100. APAAME_20081102_KHNQ-0386. As you may have gathered from the many photographs we have taken in the Jordanian harra (see our Flickr archive), Kites in Jordan are found predominantly on the basalt lavafield. Due to the sharp contrast between the black rock and yellow sands these are often easily discernible in good resolution satellite imagery and even more so in the course of aerial photography conducted each year by the Aerial Archaeology in Jordan project (AAJ). Due to improved availability of good resolution satellite imagery over the Jordanian harra I recently embarked on a review of known features over the landscape in preparation for our upcoming field season in October. Due to the reasons mentioned, the majority of the harra was scrolled over relatively easily on my desktop, but it was not all a walk in the park. The north western section of the harra was altogether more difficult to review. Our knowledge of site distribution in this area began with those traced on the 1:50,000 K737 maps. This was improved upon through an analysis of the Hunting Aerial Survey photographs undertaken by Prof. David Kennedy in the RSAME project where the information gathered from the aerial survey photographs were transcribed onto acetate copies of the 1:50,000 map sheets. 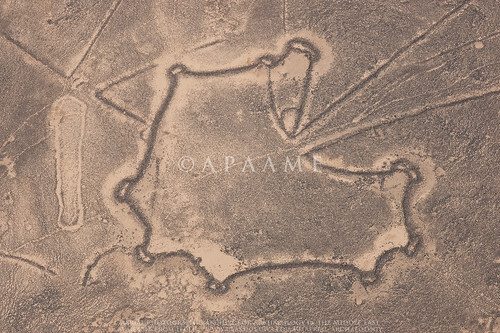 Many of these sites were reviewed through ground survey conducted in the Southern Hauran Survey Project (SHS) in the late 80s and into the 90s, and included a few Kites, and AAJ, beginning in 1997, has also flown over and documented many sites in the region. Google Earth (GE) has allowed us to utilise an affordable platform through which to easily review sites identified and photographed by the project, as well as investigate new sites for future research and documentation. In its early years the remote areas of Jordan were not a particularly high priority for high resolution imagery however, and many site locations were transferred into GE based on what was originally mapped in the earlier surveys mentioned, or locations estimated from the flight track log of AAJ aerial reconnaissance. These sites were therefore in need of the review I was conducting in order to increase the accuracy of the site location we had recorded, but also to verify whether the site first identified from earlier surveys was indeed correct. The four map squares in question - Quttein, Hibabiya, Hallabat and Jimal are now in high resolution in GE - a victory you would think that would make life easier, but no. Here the basalt is no longer a deep dark black that contrasts easily for identification, but its age has bleached it and in some cases developed a patina over the surface so that it resembles the colour of the landscape around it. Take satellite imagery in the middle of the day and what you have is a bleached out landscape where you are lucky to identify anything at all. Moreover - this area is increasingly being utilised for agriculture and many sites identified from imagery taken in 1953 are now underneath fields of green. My standard approach of panning back and forth in GE and verifying against our aerial imagery and contrasting to Bing Maps was just not going to cut it today. The faint trace of Hibabiya Kite 18 on an oblique aerial photograph. 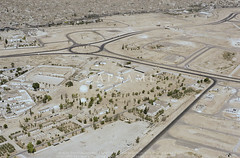 APAAME_20090917_DLK-0749. Thanks to the laborious work of Research Assistants before me, we have created an overlay in GE of the distribution of all of the Hunting Aerial Survey (HAS) photographs. Using this overlay I was able to go from site to site we had identified and pinned in Google Earth and contrast it to what I could see in the HAS imagery and had been noted on the K737 acetates. Kites were by far the most numerous feature in this landscape on the fertile edge of the harra. An important lesson was the fact that often some Kites visible on the satellite imagery were in no way or barely visible on the older HAS imagery, and some were visible on neither but clearly visible on the low oblique imagery of the AAJ project. As much as satellite imagery is an easy and resourceful tool, it definitely can not stand alone. 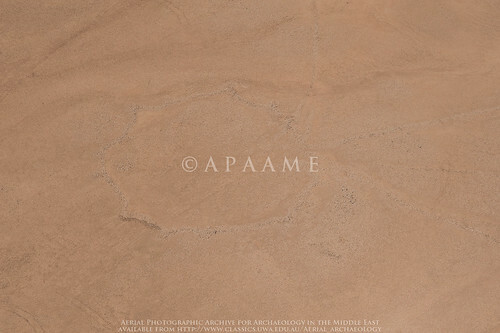 Interestingly - and not something we come across often in Jordan, some of the historical GE satellite imagery showed up Kites easily identifiable on the HAS imagery as crop marks in the now fielded landscape. These would not have been so readily identified without the HAS imagery showing us where to look, but it is an important reminder that remote sensing techniques such as identifying crop marks that are applied in more lush landscapes may also be applied in Jordan at the right time of year, especially in agricultural landscapes like the Southern Hauran.